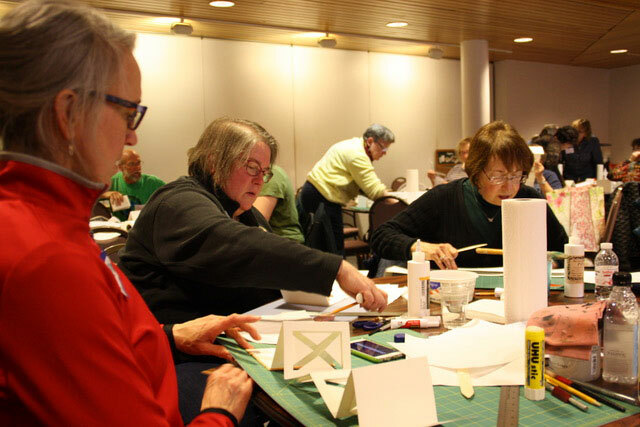 Saturday, March 18 was a fine day for a book making session with the Colleagues of Calligraphy. 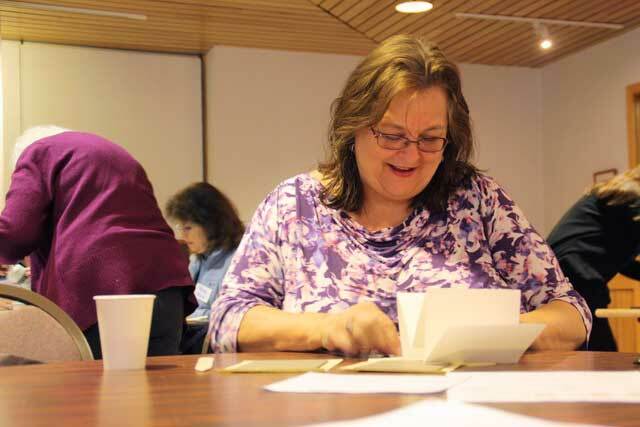 Colleague Georgia Greeley, a local artist and writer, led our members through the process of creating an accordion book with frames. 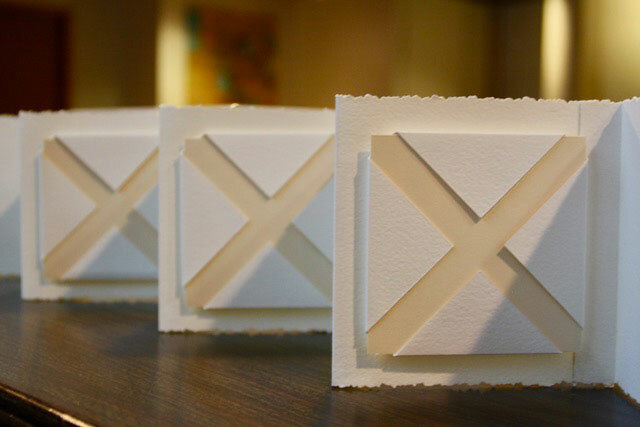 Accordion books are a relatively simple project in book making, but this particular structure deviates from the rules just enough that it becomes sculptural as it forms. With a progression of careful measuring, scoring, cutting and folding, the artist transforms the panels of the accordion into frames. When the book is viewed from the top or bottom, the dimension created from the frames evokes an image of an elongated honeycomb. 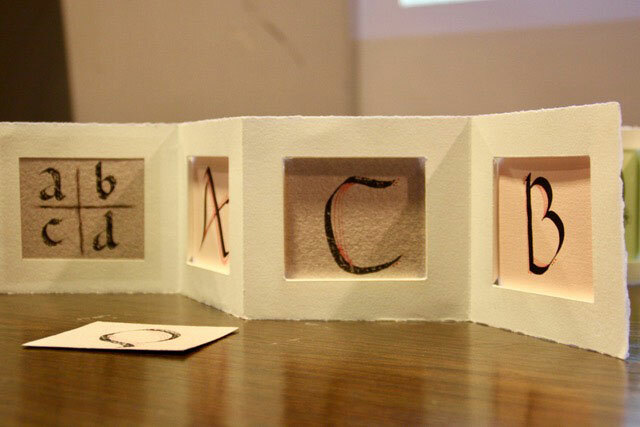 This variation on the standard accordion is ideal for calligraphers. The entire book becomes a holding ground for their skills, as they can use these frames to insert any work they would like to showcase. Georgia brought an impressive variety of decorative papers in her class supply kits. 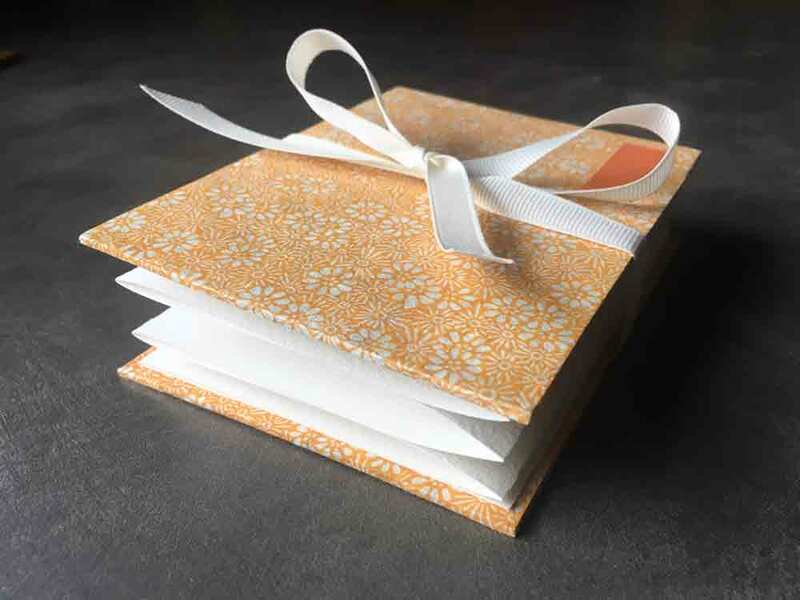 Both Asian and Western papers in solids and prints were packaged along with the other materials required to create the books. 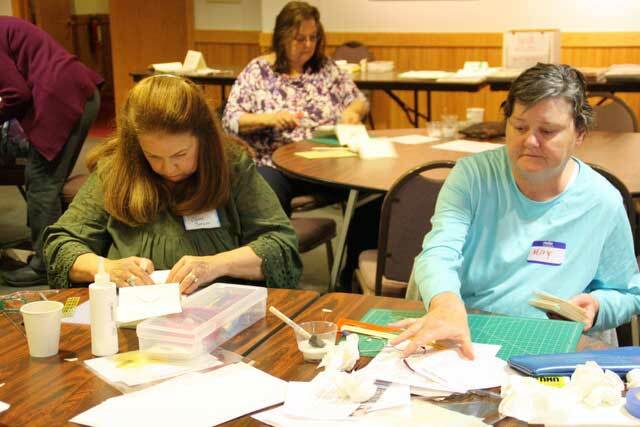 Participants were able to choose according to their personal taste, then learned how to wrap the book board, which became the front and back covers of the books. The long heavy paper intended for the accordion piece is Arches cold press 90 lb paper. Georgia explained that it is important to choose a substantial paper because it is the part of the book that requires strength to stand when the book is opened or displayed. This is also the piece that must be sturdy enough to hold the art that will be inserted into the frames. Step by step, Georgia led the group through the process of constructing the books. 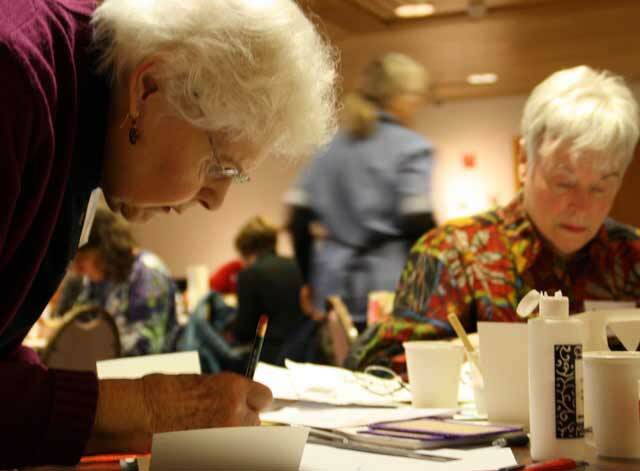 New attendees worked alongside familiar faces as the books came together. Georgia’s supply kits were complete with tastefully coordinated ribbons for closures, as well as small signature rectangles. Gluing these rectangles to the upper right corner of the front cover is not only a tasteful finishing touch, but also marks the upright and front positions of the book for when it is opened and enjoyed long into the future. 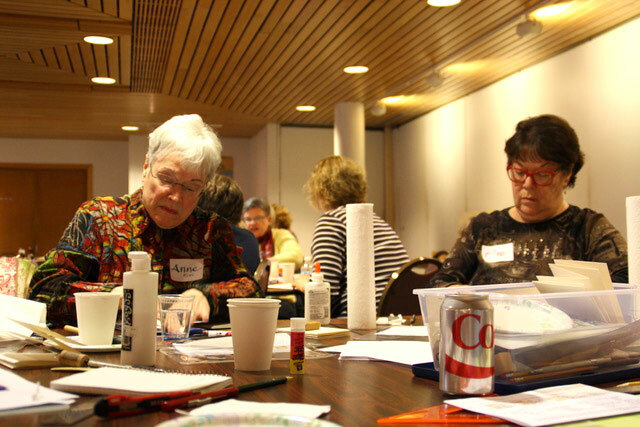 Many thanks were extended to Georgia as the participants compared their finished books with one another. 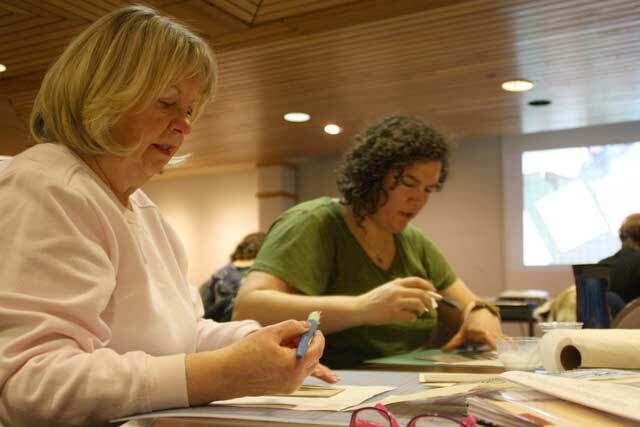 All the extra kits were sold out as participants were clearly interested in working on this new project at home, further exploring the endless possibilities of framed accordion books. Georgia Greeley is a local artist whose poetry and writing has been extensively published. She is the recipient of several prestigious grants and a longstanding member of the MN Center for Book Art’s artist cooperative. You can literally walk over her poetry which is stamped into the sidewalks of St. Paul. She is a proud member of the Colleagues of Calligraphy. To read a Q & A between Georgia and Colleague Jean Formo, click here. 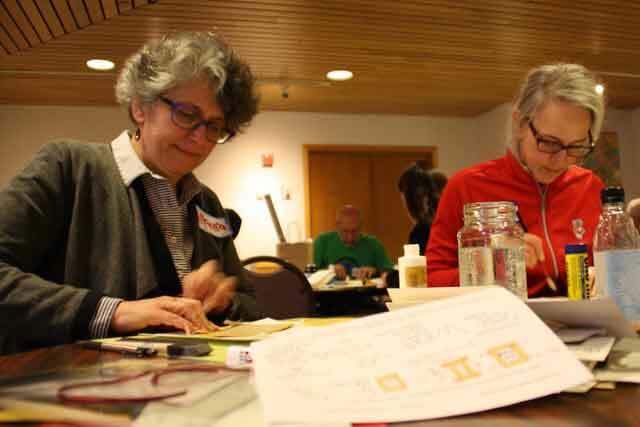 Older PostFebruary 2017 Workshop Review: Mini Workshops, Maxi Learning!